The Freemont Barberry is a member of the Barberry Family. It appears as a woody shrub and grows to 10 feet in height. 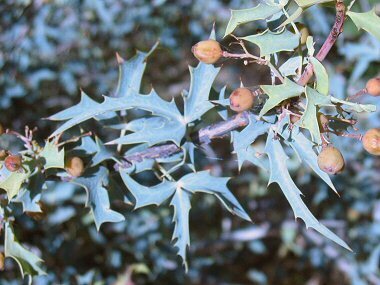 It has bluish green, stiff leaves with pointed lobes which grow in groups of 3 to 7. The plant typically grows in pinyon-juniper and pine woodlands at elevations between 4000-7000 feet. 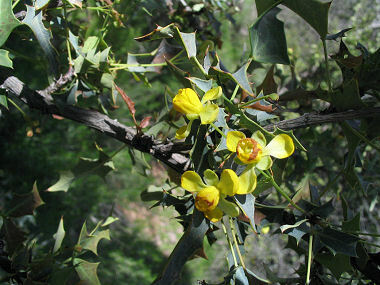 Hopi Indians used the wood of the Freemont Barberry for crafts and the roots for yellow dye. The Freemont Barberry typically blooms between April - July and produces yellow flowers with 6 petals to 1 inch in width followed by a round 1/2 inch wide berry.